Showing results for tags 'full options'. 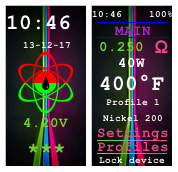 hello everyone, i have build this theme for the dna 75c. Theme is meant for new users as well as advanced users. This you can see in usage as you only need the lock, main and new atomizer screens to work the device. These 3 screens will give you all options needed to vape, however 20 more screens are available for those that like to dig in to the settings. How to use: - purple is menu layout(yellow highlight) - dark pink takes you to screens(dark blue highlight) - green is info(light blue for updates( yellow for some screens)) - white is for adjusting(red highlighted) Copying this theme. Feel free to do so. Just mention you stole it from me. Comments and suggestions. Please feel free to do so, i will consider adjusting and fixing theme per suggestion.